Showing 40 articles from April 20, 2016. 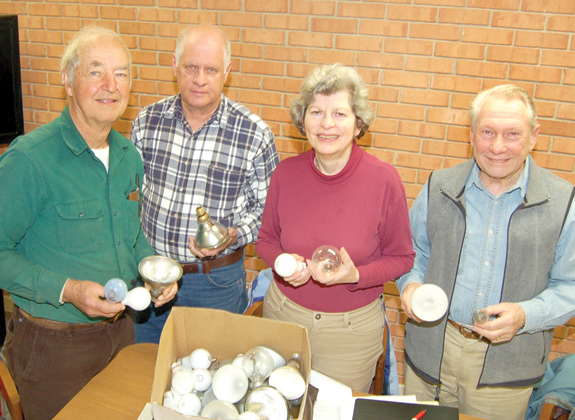 LOUISBURG -- Under old business, commissioners asked staff to dust off a project that had appeared to be left for dead. In the mid 2000s, officials and staff for both Louisburg and Franklin County explored the possibility of a partnership by which the town would build the county a new governmental complex to house most, if not all, of its departments. That prospect never really materialized and was placed on indefinite hold in 2012 when the town ended a public-private partnership it had with a local builder on a piece of property that was being considered for the complex. LOUISBURG - A group of about 60 people gathered in downtown Louisburg Saturday evening to grieve, to remember and to call for an effort to stop the violence that most recently claimed three lives in Franklin County. The "Stand Up and Stop Violence" vigil was specifically called to honor the memories of Louisburg residents Keisha Livingston and Diana Edgerton as well as Shemare Harris, who was visiting from La Grange. BUNN -- The town is set to host its second annual Bunn Fun Day on Saturday. 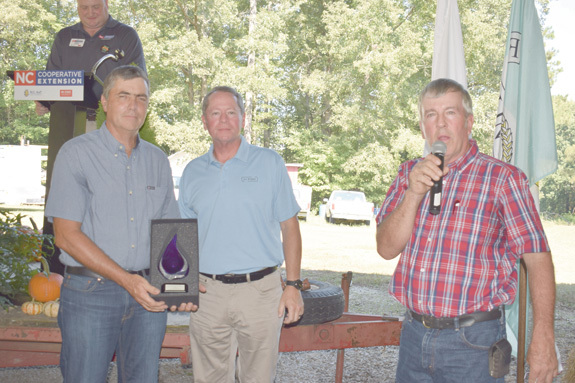 The purpose of the celebration, said event coordinator and Town Commissioner Sherry Mercer, is to recognize the town's most valuable asset -- its citizens. The event is free to the public and will feature live entertainment, food and craft vendors, games and activities for children, teens and parents. FRANKLINTON -- The county's Solid Waste Task Force and a Franklinton community group are teaming up this weekend to cleanup the town. Organizers of the Earth Day event are looking for as many teammates as they can find to come out and take part in the Spring Litter Drive. "We're inviting folks to come out and help," Town Administrator Tammy Ray said of the event slated for Saturday morning. "People can come out, we'll divide them up into teams and we'll work to tackle litter in the town." 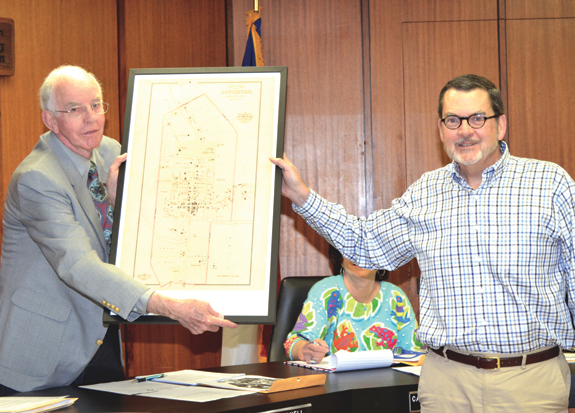 LOUISBURG -- It was a night of presentations Monday for the Louisburg town council -- and after one, they gave the go-ahead for another public art project in downtown. 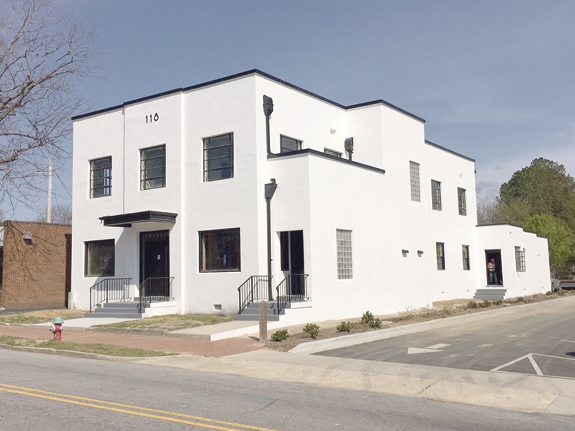 The art project is being coordinated by Louisburg College art professor Will Hinton and will feature the work of one of his students, Julian Shumpert. The idea, Hinton told the council, is to create a 12-foot high, 16-foot wide painting on plywood that would then be mounted on the stucco exterior of a building across the street from the post office, adjacent to a site the town is planning to purchase and turn into a parking lot. 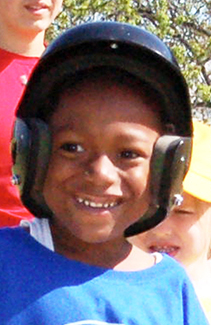 Franklinton little leaguer Dominic Brummell Jr.
What fantastic weather we've enjoyed for the last several days! Spring has finally arrived in all its glory and that has brought just about everyone outside to work, play, plant or just soak up the sunshine! I trust you're among those enjoying the outdoors -- even if it is a bumper year for pollen! And, in case you haven't gotten the word, strawberries are in -- and so is locally grown asparagus. Enjoy ... the season for both is much, much too short! Franklin County officials agree that they need a long-range plan for the county. Stop a moment to savor that acknowledgement of reality before you move on. It's certainly taken us a long time to get to this point but, finally and at long last, county commissioners and the administration agree that a long-range plan is essential for the county. Before Monday night's meeting, I knew probably everything I needed to know about Nelly Furtado. And my childhood week nights were filled with Nell Carter's antics on Gimme a Break. And some of my wilder days in the early 2000s were spent listening to hip hop artist Nelly. On Monday night, though, I think I learned everything I'd ever want to know about Nellie Stevens. 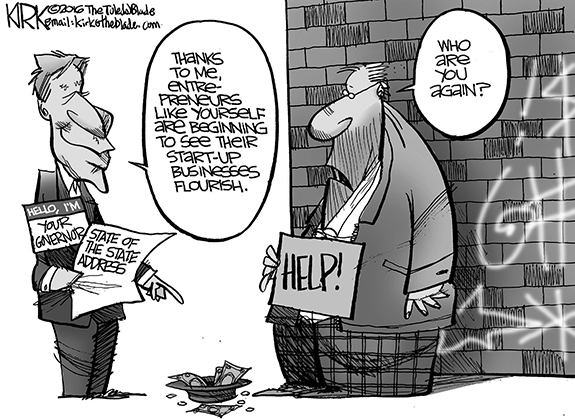 As you read today's column, I'd like you to keep the paraphrased words of a great Republican in the back of your mind: "A few million here, a few million there, pretty soon, you're talking real money." Last week the State Supreme Court ruled a law seizing the "tenure" rights of teachers unconstitutional. In reality, it is not real tenure but simply the right to a hearing if in their minds they were unfairly dismissed. ROLESVILLE - Phyllis Ann Denton May, 67, of Rolesville, passed away Tuesday, April 12, 2016. 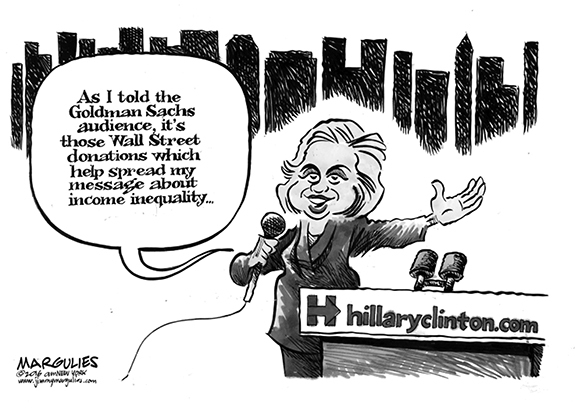 She was born in Franklin County, the daughter of the late Gladys Horton Denton and Joseph Proctor Denton. LOUISBURG - Funeral services for Arnese "Nesey" Webb, 73, who died Sunday, April 17, 2016, will be held Saturday, April 23, at 3 p.m. at Richardson Funeral Home in Louisburg. Burial will follow in the Cemetery on the Hill. BROWNS MILL, N.J.--Memorial services for Fred Dunston, 83, of Browns Mill, N. J., formerly of Louisburg, who died Sunday, April 10, 2016, will be held at 6 p.m. Saturday, April 23, at the Richardson Funeral Home Chapel in Louisburg. LOUISBURG - Funeral services for James "Taterhead" Wright, 55, who died Saturday, April 16, 2016, will be held Saturday, April 23, at 11 a.m. at Richardson Funeral Home in Louisburg, with Elder Lewis Edgerton officiating. Burial will follow in the Cemetery on the Hill. ENFIELD - Funeral services for Rosa Lue Silver, 93, who died Sunday, April 17, 2016, will be held today, Thursday, April 21, at 1 p.m. at Pine Chapel Baptist Church, with the Rev. Robert Hedgepeth officiating. Burial will follow in the church cemetery. 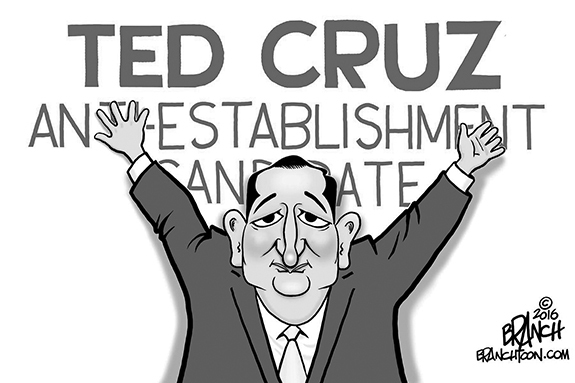 AHEAD AT THE CURVE. 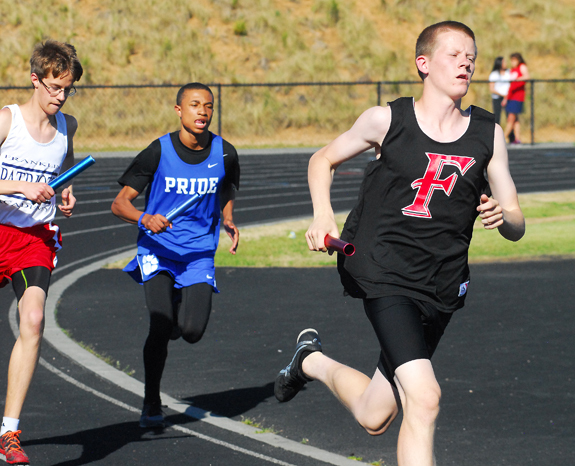 Franklinton's Hayes Tharrington leads the competition as part of Monday's track and field event on the FHS campus. FRANKLINTON -- Competitors and coaches from Franklinton and Louisburg had one eye on the meet and another on the future during a track and field event Monday at the FHS Football Field. FHS and LHS both have their respective conference meets coming up -- the Rams in the Northern Carolina Conference and Louisburg in the Tar-Roanoke Athletic Conference. HEADING TO THE GREEN. 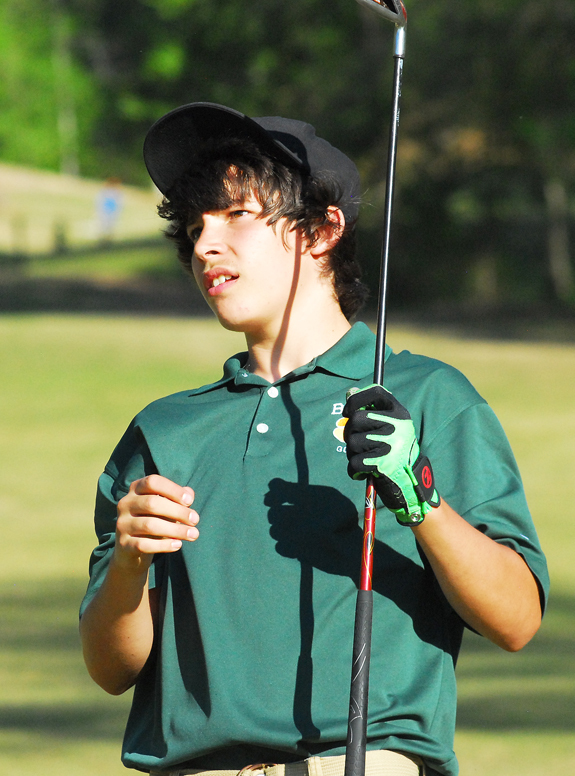 Bunn High School's Mason Horton eyes a shot as part of Monday afternoon's Northern Carolina Conference Golf Match at The River Golf Course in Franklin County. 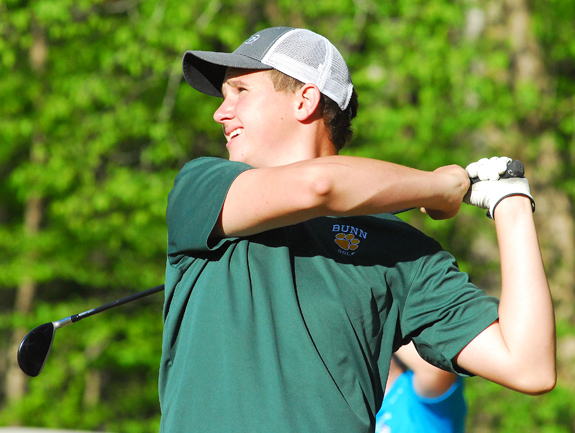 BUNN -- After the graduation of long-time standout William Lewis, it was unclear how the Bunn Wildcats would fare on the golf links during the 2016 season in the always-competitive Northern Carolina Conference. Lewis is now at Sandhills Community College, but the Wildcats continue to rev and are currently in second place in the NCC heading into the home stretch of the conference schedule. LHS SLUGGER. Katlyn Tharrington has been a four-year starter for the Louisburg High School softball squad. LOUISBURG -- Michelle Carlson's first Franklin County signee as Louisburg College's softball coach was certainly one to remember. Last Friday, Carlson headed just up North Main Street to ink Louisburg High's Katlyn Tharrington to a letter-of-intent to join the Lady Hurricanes' fast-pitch program. 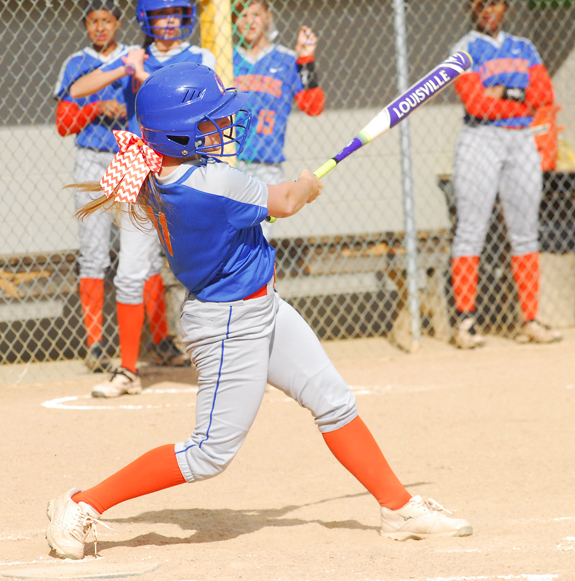 Tharrington, a speedy outfielder, has been a four-year starter for the Lady Warriors. REGION READY. 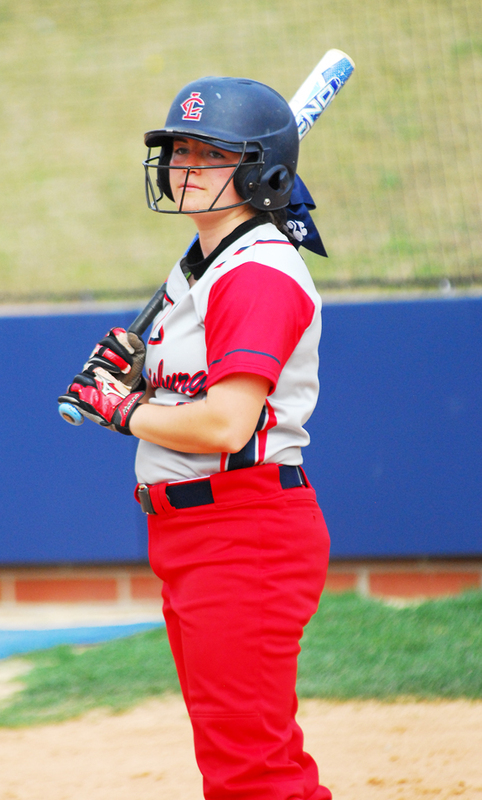 Taylor Subacius and the Louisburg College Lady Hurricanes will be in action this weekend at the Region X Softball Tournament in Spartanburg, South Carolina. LOUISBURG -- Louisburg College saved its best for last in 2015 as the Lady Hurricanes' softball team soared to the Region X Tournament Championship -- and earned a berth in the districts. That will once again be the goal this coming weekend as the Lady Hurricanes will look for a repeat at the annual event. This year's tournament is being held on the campus of Spartanburg Methodist College in South Carolina. 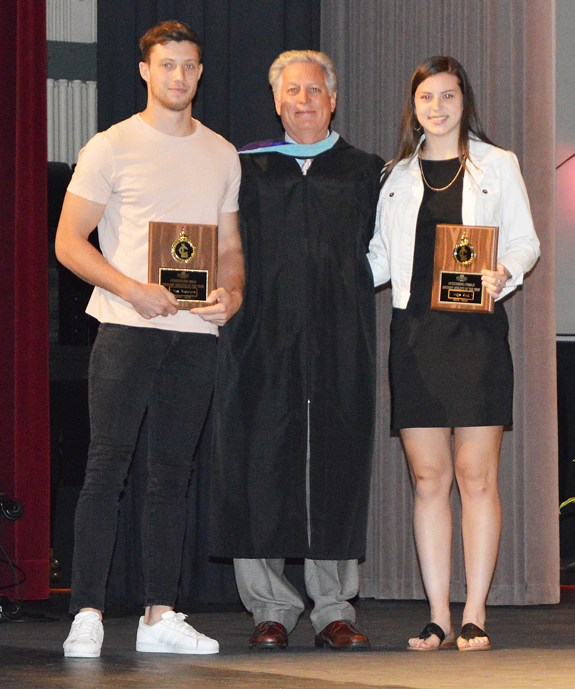 BUNN -- Soccer stole the show when Louisburg College's Most Outstanding Student-Athletes were saluted last week on the LC campus. Louisburg College's most prestigious athletic honors went to sophomores Abigail Ross (women's soccer) and Max Blackmore (men's soccer). They received plaques from LC Athletic Director Mike Holloman. 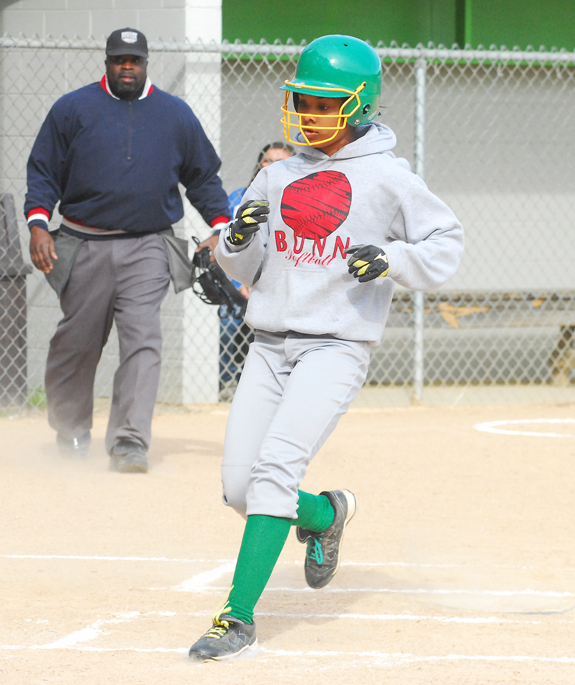 BUNN -- One of the low points of Bunn's season to date -- in both softball and baseball -- were tough losses earlier in the campaign at Northern Carolina Conference foe Roanoke Rapids. BHS was able to avenge both of those defeats Tuesday at home. In baseball action, the Wildcats overcame an early deficit and went on to top the Yellow Jackets by a 10-3 margin. ZEBULON -- The Carolina Mudcats lost a 3-1 seventh inning lead and fell to the visiting Pelicans 4-3 on Sunday afternoon at Five County Stadium in Zebulon in a Class A Carolina League baseball game. The Pelicans bounced back in the seventh with three runs and took the final two games in the series to leave with a series split. Sunday's loss in front of 2,844 at Five County Stadium dropped the Mudcats (6-5) out of first place and one game back of the Salem Red Sox in the first half Carolina League Southern division standings. HENDERSON -- Vance-Granville Community College has named DeMarcus Oliver as the new head coach of the Vanguards men's basketball team. Oliver served as assistant coach, and later interim head coach, for VGCC during the 2015-2016 season. He will lead VGCC's program into its ninth season of play in the National Junior College Athletic Association (NJCAA) Region X this fall. Oliver is a Granville County native and a 1999 graduate of J.F. Webb High School in Oxford, where he was a year-round student-athlete, participating in basketball, football and outdoor track. BUNN -- Bunn High School's football program will host a car wash this Saturday on the BHS campus. The event will run from 9 a.m.-1 p.m. and will help pay for the Wildcats to attend the Fellowship of Christian Athletes Football Camp in June. CANES 5-K: The Carolina Hurricanes have announced that registration is now open for the fourth annual Canes 5-K Run. 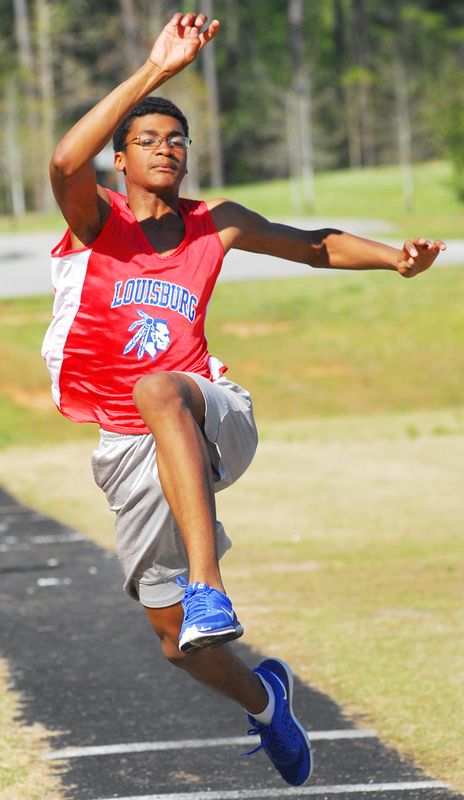 Louisburg High School's Malvin Silva competes in the long jump at Monday's track and field meet at Franklinton High School. 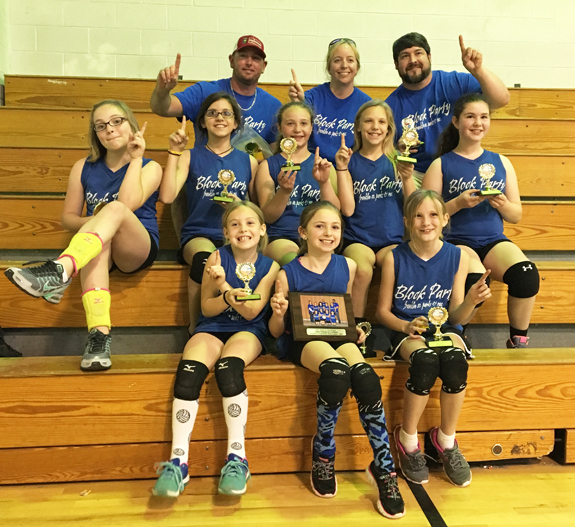 The Family Pharmacy of Louisburg Block Party repeated as the champions in the 7-10 Division of the Franklin County Parks and Rec Volleyball League. The Block Party went undefeated in league action last summer and performed the same feat this winter while compiling a 10-0 record. Five players from that club were also on the summer team. In the final match, the Block Party topped Mission Un-Blockable in a matchup of unbeaten clubs. Bunn High School's Presley Johnson watches an approach shot on the ninth hole at The River GC as part of Monday afternoon's Northern Carolina Conference golf match. 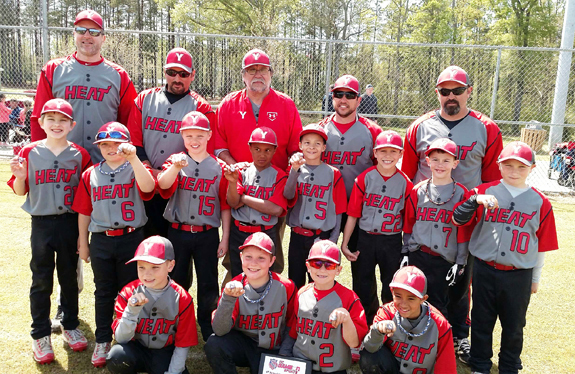 The Youngsville Heat recently took first place in the 8-U Division at the Sixth Annual Grand Slam Super Regional AAU Baseball Tournament in Granville County. In the championship game in Oxford, the Heat defeated the NCDB River Cats 14-1 to receive rings. In four tourney games, the Heat outslugged opponents by a combined score of 74-30. CHERRY HILL PERFORMANCE. Pianist Mayron Tsong will return to Cherry Hill Sunday, April 24, where she has thrilled audiences in years past with her virtuosity and charisma. 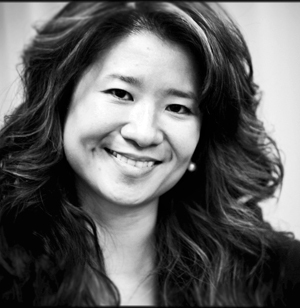 The former head of keyboard studies at the University of North Carolina at Chapel Hill, Dr. Tsong is now associate professor/artist teacher of piano and director of undergraduate studies at the School of Music at the University of Maryland. Tsong has performed around the globe and in almost every state in the continental United States. Every step taken toward eating more fruits and veggies helps you and your family be at their best because eating fruits and vegetables may reduce your family's risk of many diseases. The Dietary Guidelines for Americans recommend eating more fruits and vegetable than any other food group. Temperance Bonner Williamson and Kenneth Stuart Pannill of Wilmington were married on Saturday, April 16, 2016, at Louisburg United Methodist Church in Louisburg. The Rev. George Willis Logan Jr., cousin of the bride, and the Rev. Dr. Michael Wayne Safley, officiated. Following the ceremony, the bride's parents hosted a wedding reception at the Timberlake House. The Terrell Lane Middle School 6th- 8th grade students in Marchetta Grantham's class celebrated African-American History Month. For one week, the students identified African-American authors from Franklin County, including Gwendolyn Starr, Tensie Taylor, James Smith, Cheryl Avery, Dr. Beverly Joseph and Jonique Lynch. The books by these authors can be found at the Franklin County Library. BROWN AWARD. Dr. Martha Bragg presents the James H. Brown Award for mathematics to Julian Cox. 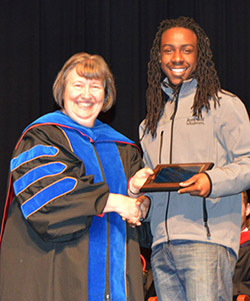 Louisburg College celebrated student success during the annual Awards Day ceremony, held Tuesday, April 12 in the Jones Performing Arts Center (JPAC) on campus. Thirty-four students were recognized for their accomplishments in all aspects of campus life, including academics, leadership, the arts and athletics. One of the highlights of Awards Day is the presentation of the Bessie Arrington Gupton Distinguished Service Award to a student, faculty or staff member for outstanding and extraordinary service to the college. 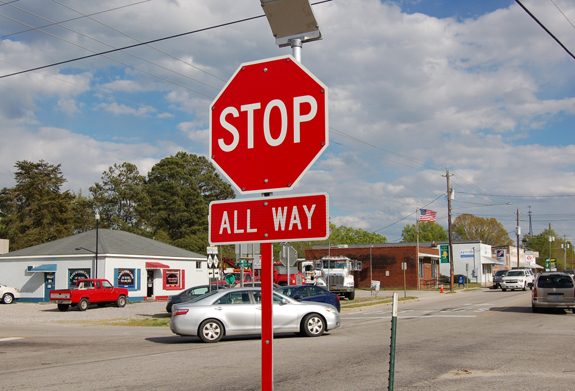 BUNN -- A four-way stop went in earlier this month at one of the town's major intersections and the new device admittedly has caused some confusion and congestion. Its long-term goal, the State Department of Transportation said, is to make the intersection safer. For at least a year, Bunn Commissioners have requested that DOT install a traffic signal at N.C. 98 and Main Street (N.C. 39) to improve safety and traffic flow at the intersection. LOUISBURG -- Police arrested a Louisburg man last week, alleging he shot into an occupied car. No injuries were reported in the April 14 incident in the 100 block of Edgerton Street just before 2 p.m. Shortly after officers heard the shots, they arrested Darryl Mayo, charging him with assault with a deadly weapon with intent to kill, possession of a firearm by a felon and discharging a firearm into an occupied vehicle. YOUNGSVILLE -- A Garner man who led officers on a high-speed chase that began in Youngsville, rushed through Wake Forest and came to a crashing halt in North Raleigh is to appear in Franklin County court next week. William L. Stephany Jr., 38, is also slated to appear in Wake County court next month. Franklin County Sheriff's Office Chief of Staff Terry Wright said Sgt. D.S. Wester attempted to stop Stephany after a motorist called 911 on April 16, telling dispatchers they witnessed an older model, camper-style pickup truck cutting people off while heading north on U.S. 1. 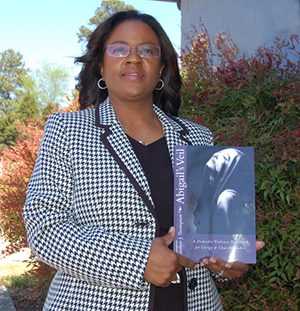 HENDERSON -- Area District Court Judge and minister Carolyn Thompson will sign copies of her book, a resource clergy and church leaders can use to address domestic violence. Thompson relies upon both of her strengths, legal and biblical, to help religious ministries combat abuse that might be within their congregations.